What Is My Target Heart Rate for Losing Weight? The computerized display on the front of the treadmill does not have to be confusing. 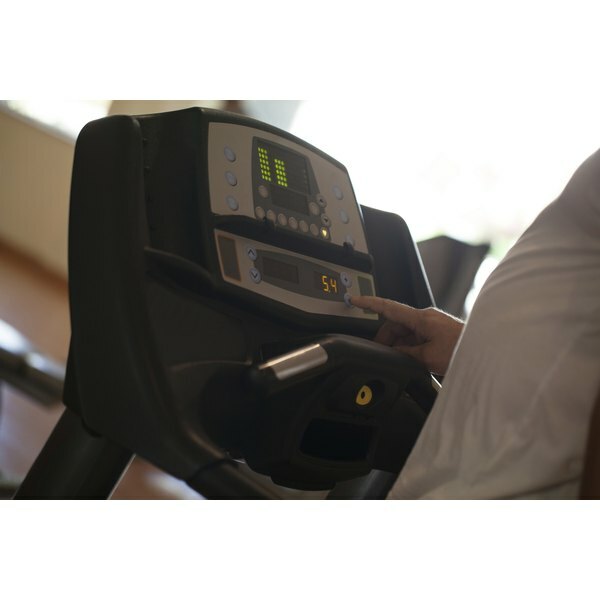 It is there to be helpful, so you can program the treadmill to match your personal needs. Your workout is not the same as the person next to you or the person who was on the treadmill before you. It is important to program the treadmill each time you step on it, so you can focus on the workout and let the computer do the rest. Once it is programmed with your information, the display tells you an approximate number of calories burned, the distance you cover and your total workout time. Stand with one foot on the platforms alongside the moving belt. Press the on/off button to turn on the treadmill, or attach the safety key. Select a predetermined program, such as intervals, hills, random, weight loss or manual, in which you adjust the speed and incline. Enter your body weight by pressing the up/down arrows until you locate your weight. Enter your age by pressing the up/down arrows. Enter the total workout time, usually up to 60 minutes, by pressing the up/down arrows. Select the maximum incline by pressing the up/down arrows if you chose a predetermined program. For example, select an incline of 8 as your maximum hill. Choose a maximum speed for your pre-determined programs by pressing the up/down arrows. For example, select a speed of 5 mph for your fastest speed to be at a slow jog. Press start to begin your program or your manually adjusted workout. Exercise for at least 150 minutes each week to see health benefits. If your goal is weight loss, increase your workout time to at least 250 weekly minutes. Speak with your doctor before you begin any exercise program.